Finding the right choir for you can be tough, but as I’ve said before, joining a choir is a great way to improve your singing and musical skills. Here are five really important questions to ask yourself before you start looking at the myriad of options available. How Does the Choir Learn the Music? Some choirs use sheet music, while others learn “by ear”, or more accurately, “by rote”. Using sheet music opens up a range of more difficult (dare I say, interesting) repertoire than can be learned just by listening and repeating. It also means things can be learnt more quickly. If the choir uses sheet music, you will get a real boost in your sight-reading abilities. However, you want the choir to challenge you, but not leave you behind, so ask the director if you can find out more about what kind of repertoire you’ll be singing and how fast you have to cover it. A good number of choirs audition, and they auditon for lots of reasons. Some want to check if you can keep up with the sight-reading needed. Others might be looking for a particular vocal sound. The most prestigous will want the whole package. You might find a choir auditions sopranos and altos, but doesn’t audition tenors as they’re a bit short handed. The size of the choir will give you an idea of how difficult the auditions are to pass, and you should definitely ask the director what you have to do and how formal the process is. You might also ask how many people are successful, and how many are turned away too. 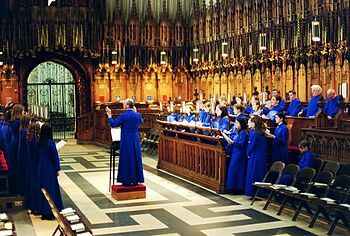 There’s a choir for every genre of music, but the main types you find are traditional choirs (singing classical music usually with sheet music), pop choirs (singing contemporary music learned by rote) and church choirs (singing religious music, usually with sheet music). You definitely want to look for a choir whose music you enjoy, so why not go along to a concert or service to hear the choir and decide if you like the general kind of music they sing. You won’t like every peice, so consider the overview more than the specifics. What kind of performance do they give? The TV show Glee has led to a rise in the “show choir” in the UK. There are now more and more choirs who really go to town with their performances including dance and costume. Some choirs are more sedate, going for some swaying and clapping. Others are much more formal and just stand with book in hand. Think about what is most comfortable for you. You should be able to find out about this easily. This is also the point to consider if you have any mobility or health issues that might affect your ability to stand still for a long time etc. Some choirs are free. Some might even pay you to be part of them (church choirs, for example). Others charge a membership fee to cover the cost of the musical director and accompanist, hall hire and books. There may also be charges for loan of music or buying choir t-shirts. You should ask what costs are entailed, and make sure that you check about extras, not just the membership fee. If you do have to pay, ask about the arrangements for leaving the choir – do you get money back, or can you only leave at the end of a subs period? Are you part of a choir? What kind of choir is it? How did you find it? This entry was posted in General, Teaching and tagged choir, choral singing, learning, performing, tips & tricks on 25th March 2014 by .